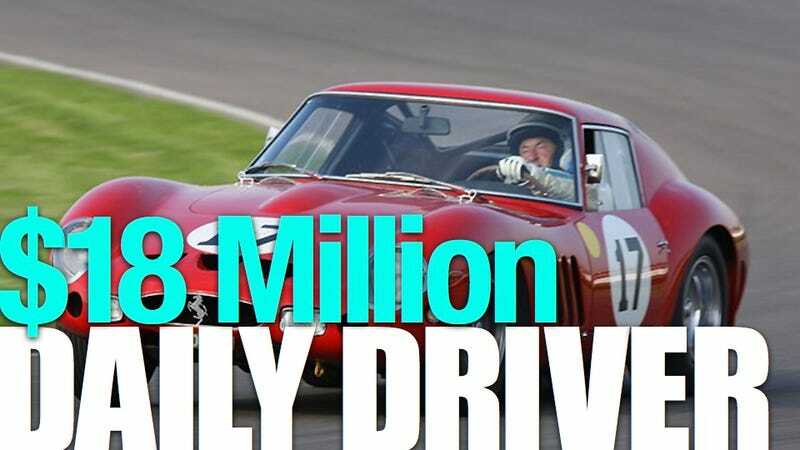 Filmmaker Stephen Mitchell has been fortunate enough to own a few Ferraris in his lifetime, even spending a moment in the pits at Monza with Enzo Ferrari and Juan Manuel Fangio. Here he recounts daily driving a 1962 Ferrari 250 GTO, at age 19. — Ed. The 250GTO #3987 was the third car I'd ever owned. The first was a 3.8 E-Type Jaguar. It was a beautiful car, but featured a low-revving six cylinder with an unsynchronized first gear that was like a granny gear off a truck. The car was more at home on the open road than negotiating the beach canyons of Los Angeles. The second was a Ferrari Berlinetta Lusso. It was very different from the Jaguar with its V12 redlined at 7000 rpm. The Lusso loved the canyons as much as it did the highway. Just as the Lusso was a world apart from the E-Type, so was the GTO an advance over the Lusso. It was a high-revving V12 with six Webers and the gearbox was a 5 speed compared to the Lusso's 4 speed. I don't recall which final drive ratio it had, but upon entering a freeway, I would be passing the fastest traffic before needing to shift to second gear. This was worlds apart from the E-Type that would barely get you to 25 mph before requiring a shift to second. Seen in the context of its time, there was nothing quite like the GTO. From 1967-70, 3987 was my principal form of transportation, though I also had an Alfa-Romeo Giulia Veloce spider and the family Cadillac as back up. When entering the cockpit, I never got used to the fact that the pedals were so close. I'm 5'10″ and my knees were splayed around the steering wheel in an effort to fit into the car. Anyone who has ever made this complaint about a Lusso or GTE never sat in a GTO! This lack of legroom was probably a result of the rearward placement of the engine for better weight distribution. The bulkhead behind the seat limited aft seat travel, so there was no way to adjust for comfort. I always had it in mind to have the pedals moved forward, but never did. I once had a conversation with Mark Slotkin, a former owner of 3987, and he also had a list of things he wanted to do with the car that were never done. You adapt to the GTO, it doesn't adapt to you. I've heard similar remarks made about the Old Man. Headroom was fine and the seat was comfortably wide. One of my favorite things about the car was the position of the gear lever in relation to the steering wheel. Visually, that marvelous aluminum gear knob looked as though it would be too high for comfort. One is accustomed to having to reach down for the lever to shift. With the GTO, the knob was only inches away from the wheel, so shifts could be made very quickly with a short lateral move of the hand. In front of you, the tachometer had a telltale that would move to–and remain at– the highest revs attained. I rarely exceeded 7500 rpm. The view forward was defined by the two dramatic fender bulges and the "power bulge" in the center of the hood that made room for the twelve velocity stacks above the six Webers. It was a very exciting place to be! When turning and pushing the ignition key, one was treated to a peculiarity common to Ferraris of the time. The starter motor made a constant whine instead of the more cyclical sound of most starters. To me, it was reminiscent of an aircraft starter. The engine always fired easily and suddenly you would feel the nervous tension of twelve cylinders turning over at 1000 rpm. It took awhile to warm up thanks to the dry-sump and large oil tank. First gear was to the left and back in the slotted gate and the clutch would engage directly without the care required by the Lusso. For the first 3000 miles that I drove 3987, I kept it to 5000 rpm, as I recall. I did this on the advice of my mechanic, Sal DiNatale, who had just rebuilt the engine. The day I got the car out of the garage (the engine was in pieces when I bought the car) I drove it to Phoenix, Arizona as a break-in trip. A friend of the family was directing an episode of the television series "Then Came Bronson" on location in Tempe and I thought it would be a good opportunity to get to know the car. I left Los Angeles about 9pm and drove all night. Apart from the yoga position my legs had to adopt, the car was very peasant to drive. The sound of it was louder than the Lusso and the suspension was clearly race-tuned. Even at the conservative revs I was using, the car was delightful to drive and must have been a sight to other drivers on the road with its two orange "Le Mans" lights lit up on the roof. That night I became accustomed to hearing a car breath for the first time. It is the interesting sound of air being sucked through the twelve velocity stacks as you increase pressure on the accelerator pedal. I might have heard this on the Lusso were it not for the air filter masking the sound. But, this was new to me and re-enforced the fact that this was a race car. I also had the impression of the timing chains being noisier than those on the Lusso. This may have been owing to the lack of insulation, but it was thrilling to hear all the noises that are usually subdued. It made every drive an adventure. Sometimes, believe it or not, the Lusso was just transportation. The GTO never let you forget it was a star! If the GTO had any agenda of its own, it wanted to go faster. The day came when I was given the go-ahead by Sal to let it out and see what the car could do. I did. Up to that time, I had only taken it to 5000 rpm and was already in love with the car. Imagine what happened the first time I took it to 7500! At about 6-6500 rpm, the sound of the engine changes entirely from a low pitched growl to a high pitched banshee scream. It was a transcending experience and it felt like the car was thanking you for giving it release. It was an adrenaline rush every time I experienced it. Fortunately, the people in my neighborhood appreciated this sound and would often stop me in public to convey their amazement about the car. I was often stopped in public by members of the California Highway Patrol who also seemed to appreciate the sound. The racing history of the GTO speaks for itself. My time with the car was subsequent to its time on the track, but prior to the organization of historic races that feature these cars today. However, I did instigate or take part in a great many informal gathering during which other cars of its kind were present. One very memorable event was staged at Willow Springs Raceway. My acquaintance and fellow GTO owner Mario Tosi wanted to have a farewell party for his GTO, so a bunch of us went with him and spent the day racing our cars on the track. Present that day were three GTOs (Cord/Tosi/Mitchell), a California spider (Peter Helm) and at least a half-dozen other cars. It was a great afternoon. For at least half the day, I was letting different people ride as passengers and it is interesting how this affects the handling dynamics when near the limit. The oil sump tank is located behind the passenger seat and probably provides some natural balance to offset the driver's weight. The car was fairly neutral – though not in the way that a mid-engined car is neutral – and would oversteer on command. I liked the handling and it was a very forgiving car in my experience. On many occasions, the car would be seen in tandem with the famous Breadvan, which then belonged to my friend Matthew Ettinger. He, too, used his car as personal transportation and many are the times that we jointly recorded "Fastest Time of the Day" on one or more of southern California's highways and byways. The GTO was well-suited for sustained high-speed runs, as one would expect. Very often, I would get in the car and drive it from my home in Los Angeles to Las Vegas, Nevada. On these occasions, the car performed without any complaint and I would maintain a cruising speed in the 140 mph range, slowing to about 80 mph when approaching other cars that I would be passing. It never overheated or displayed any temperament. The only concessions to street driving were the installation of an electric fan for the radiator and the use of cooler spark plugs. If the GTO had any agenda of its own, it wanted to go faster. No matter how fast one was traveling, it was always the easiest thing in the world to make it go faster. After driving at 145 mph for a time, the slightest input took the car to 150 and above. If one were to compare the GTO's performance figures to those of more recent cars, one might begin to wonder what the fuss was all about. Even Porsche 911s that came not too long after could match it dynamically. The GTO was the dominant GT of its time and though that time has passed, what hasn't is the manner in which the GTO delivers its performance. It had a personality as defined and characteristic as the man whose name it bore. It is a genuine icon with all of the history, myth, legend and chicanery attached to it that one would expect of a car now valued in the millions of dollars. The memory of the engine screaming as it came on the cam and the snick-snick of that excellent gear change makes almost any other car irrelevant to me. I was able to enjoy the car in a way that current owners wouldn't dream of. That wouldn't stop me for a minute, however, if the opportunity to have it back again ever presented itself. Stephen Mitchell is working on a documentary about the 250 GTO. The Ferrari 250 GTO #3987 is currently owned by Ralph Lauren. This story originally appeared on Teamspeed.com on Feb. 1, 2011, and was republished with permission.